Each year the Hilton-Baird Group does something extraordinary to raise money for charity. From extreme physical challenges such as walking the 68 mile circumference of the Isle of Wight in under 24 hours to wearing red in support of the British Heart Foundation, there’s always something we’re preparing for. We also incorporate charitable donations within our industry research and sponsor events. These are just some of the charity challenges we’ve completed over the years, raising over £45,000 for our chosen charities. Thank you to everyone who has contributed to raising such an incredible sum for these fantastic causes. What did we do? Our staff raised more than £2,000 by taking part in a wide range of activities throughout the month of October as part of Breast Cancer Care’s Big Pink campaign. 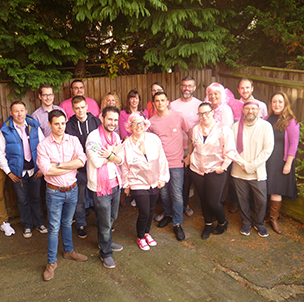 These included wearing something pink, a food sale, charity sale, and even donating to be able to throw things at our CEO, Alex Hilton-Baird, who kindly agreed to face the stocks in the name of charity! What did we do? In 2016 our CEO, Alex Hilton-Baird, put his body and mind to the test in order to raise money and awareness for two superb charities. First he took on the 14km Thames Marathon in aid of Wessex Cancer Trust. 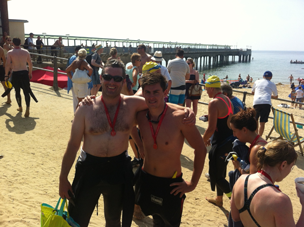 And then he completed the Solent Swim for Aspire. Swimming a total of 23.3km, it was one of the toughest challenges he has faced to date but it was worth it to be able to support two fantastic charities. Hilton-Baird matched the £3,006 that was raised. What did we do? 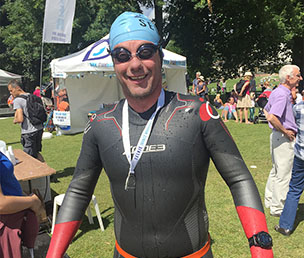 Keen to do something extraordinary in the name of charity, our CEO, Alex Hilton-Baird, completed a trio of exhausting swims in the space of just three months. Alex took on the Great North Swim, Bournemouth Pier to Pier swim and the Dart 10k – a total of 17km – to raise money for Cancer Research UK, the British Heart Foundation and Julia’s House children’s hospice. Hilton-Baird matched the £2,755 that was raised. What did we do? Together with thousands of people across the nation our team wore red to raise money and awareness for the fantastic charity which funds lifesaving heart research. 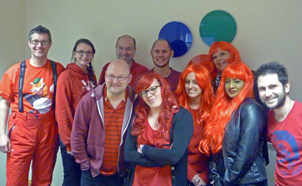 It brightened up the office for a day and helped aid the fight for every heartbeat. What did we do? 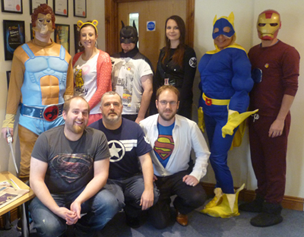 To coincide with BBC Children in Need’s appeal night our team ditched their office attire and dressed up as superheroes to raise money for the fantastic charity which helps disadvantaged children across the UK. We also held a superhero quiz to test the team’s brainpower and boost our donation even further. What did we do? This was by far our hardest challenge yet. 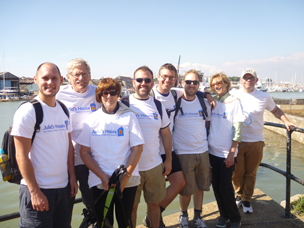 Seven of the team walked the 68 mile circumference of the Isle of Wight in under 24 hours to raise money and awareness for Julia’s House children’s hospice, a fantastic charity which provides crucial support to life-limited children and their families across Dorset and South Wiltshire. Hilton-Baird matched the total raised. What did we do? 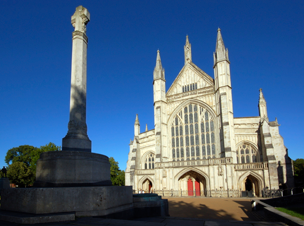 Sponsored this special concert at Winchester Cathedral, where the Gaudeamus Chorale performed Fauré’s Requiem in aid of Cancer Research UK. This was one of three events that took place across the south, which also saw the choral societies visit Chichester and Salisbury. What did we do? 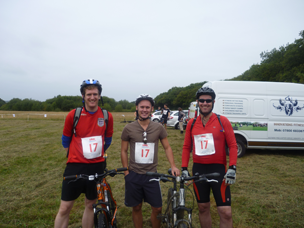 This was a triathlon with a twist; a team triathlon whereby three of us cycled 19 miles, kayaked 2 miles and ran 8 miles across the Isle of Wight. Despite various equipment malfunctions, a river current eager to send them to France and a bucket load of lactic acid, the trio finished the event in a respectable four hours and 35 minutes, helping to raise money for three local charities: Wessex Heartbeat, Sail4Cancer and The Rainbow Centre. What did we do? 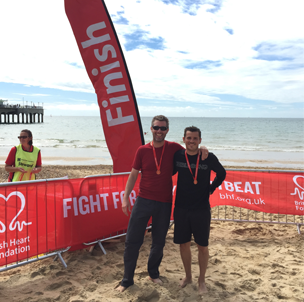 Not content with the rigours of the Wightlink Wight Challenge, our CEO, Alex Hilton-Baird, swam the 1.4 miles between Bournemouth and Boscombe Piers in aid of the British Heart Foundation. Having been born with ‘heart murmur’ and requiring open heart surgery at 8 years old, Alex was keen to support a charity that was quite literally close to his heart. Again, Hilton-Baird matched the £1,000 total that was raised. What did we do? Not for the faint hearted, the renowned Three Peaks Challenge involves climbing the three highest mountains in Scotland, England and Wales in under 24 hours. After founder and director of the Hilton-Baird Group, Alan Baird, was diagnosed with bowel cancer, the team decided it was time to do something memorable. 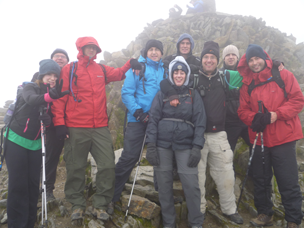 So nine of us tackled Ben Nevis, Scafell Pike and Snowdon in support of Macmillan Cancer Research, completing the challenge in 24 hours 45 minutes – just outside of the target time! Hilton-Baird matched the £4,220 total that was raised. What did we do? 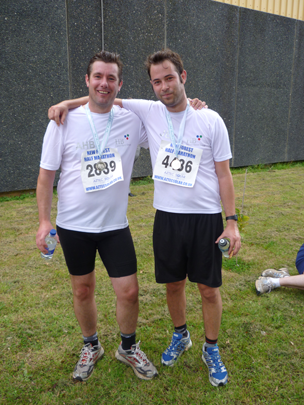 After much training and preparation, Alex and James ran in the annual New Forest Half Marathon to raise money for the British Heart Foundation, which Hilton-Baird matched. Both of them clocked excellent times of just over two hours, and survived to tell the tale! What did we do? 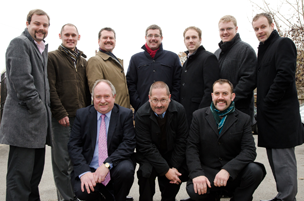 Several of the Hilton-Baird team decided to ‘grow a mo’ in aid of The Movember Foundation. This annual event sees men across the world letting their facial hair loose to raise funding for the fight against prostate cancer, testicular cancer and mental health. Though not quite as physically demanding as some of the other challenges the team has completed over the years, for some of us it was no less of a challenge!